Skating is not just popsicle decks at the skatepark or nailing lines in the streets of your town. There’s a wide variety of different types of longboards spanning a number of deck shapes and styles. 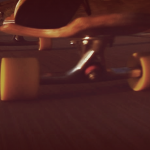 Normally, longboarding is associated with skating anything with four wheels that isn’t a street deck or a mini cruiser. Most folk that do downhill will tell you it’s all just skating no matter what you ride, while others will try to tell you they’re worlds apart. Truth is, it’s all just skating; different boards are designed for different tasks. At the end of day, we’re all riding rolly planks. Once you know the style you want and are ready to buy, check out our article on the top 5 best longboards for beginners. Certain board types are preferred for some skate disciplines, and that’s what this article will cover. Keep in mind that a set up is all about personal preference. What works for one person might not work so well for another. What kind of longboarding deck should I get for [insert discipline]? First thing to figure out is what kind of riding you want to be doing. If you’re just starting out it’s easier to pick up a board meant for cruising, like a pintail or a drop-through cruiser. Personally, I like to recommend single kick freeride decks. The shape is intuitive and good looking. It’ll be as easy to ride as an average pintail, but a bit stiffer. The stiffness plays an important factor if you decide to get into faster stuff. The kicktail means you can also eventually learn to ollie up and down curbs as well as learn some flip tricks. Anything that resembles a typical skateboard is acceptable. Top mounted with short wheel bases so they can be as agile as can be. The popular shape is the popsicle, though they can come with directional shapes like old school pool decks. The average park deck is 32” long, but you can go a big longer than that for street and techslide. Go for a mild, comfortable concave, as you don’t want aggressive concave. Everything else is up to you. You can cruise on a longer wheelbase pintail or a more squirrely mini cruiser. A lowered platform does make cruising more comfortable. 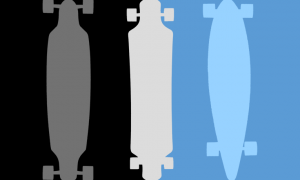 Check out our article on the best cruising longboards for our 5 favorite boards. Have the standing platform as low as it can be. Double drop-throughs with longer wheelbases are the most common thing riders use for this. A very mild and comfortable concave is key; you’re going to be covering lots of distance so it’s important to take care of your feet. Most decks for dancing have a generous amount of flex, even though they don’t have to. More often than not they are symmetrical and top mounted, it’s key to nailing those fast cross steps to have plenty of leverage over the trucks. What’s used in freestyle is really up to the rider. The two most common options to go with are drop decks or double drop decks with kicktails or longer top mounts with kicktails. Kicktails are essential in a discipline that’s about popping tricks. A discipline not many people know much about is slalom. Slalom set ups are designed to turn as fast as possible. A slalom deck must be stiff, low weight and have a short wheelbase. Sometime slalom riders will mount the trucks on the kicktail. This make the platform over the truck higher than the rest of the deck, giving a lot more leverage over it. Look for a stiff and relatively long wheel base. Most all freeride decks have wheelbases longer than 24”, depending on how fast you’ll want to be go. What feels good to you can go longer or shorter, although longer is usually preferred. Some people will prefer aggressive concave to go along with extra coarse grip tape so their feet don’t slip while sliding. Rock solid, preferably with some drop, and long 29” wheelbases are pretty common with downhill longboards. Downhill decks have to be set up to be stable enough to withstand the speeds it will be ridden at. A normal run would be at 50 mph or higher. Contrary to popular belief, mild downhill is not very mild; it’s typically done at 40mph which really is slower downhill. Downhill is not a discipline to start right away with, as certain skills have to be mastered before you throw your plank with wheels as fast as you can down a road. Slalom and freeride help develop the turning and sliding abilities necessary for downhill. If you plan on taking things downhill, you’ll want to upgrade to better longboarding wheels. The newest type of longboard is the electric longboard. Many traditionalists tend to be against the electric version, however the fanbase is growing rapidly because of the appeal to commuters and beginners. You’ll be spending a bit more money on an electric longboard, so make sure you read our best electric longboard article so you don’t waste your money on a junk board. Each feature in the board does something specific to enhance the ride in a certain way. For each discipline, riders will prefer some board types over others. The wheelbase is the distance from one inner mounting hole to the other. The rails are the edge of the board. The nose is the front kicktail. The tail is the back kicktail. Boards have different flexes ranging from extremely springy to rock solid. The most noticeable element of a board is its shape. There are a wide variety of shapes boards can come in; some are functional while some, not so much. Assuming you’re not buying the Santa Cruz foot shaped skateboard, there are two main types of longboard deck shapes. Symmetrical boards have horizontal symmetry, both ends are the same. The most popular symmetrical board design is the popsicle deck, your average street skateboard. Symmetrical boards are meant to be ridden either way. If the shape is symmetrical, more often than not, the concave is too. Symmetrical board designs are preferred for street and park skating, as well as freeride, freestyle, techslide and dancing. Directional boards are asymmetrical through its horizontal axis. The front and the back are not the same. Asymmetrical boards are meant to be ridden one way. 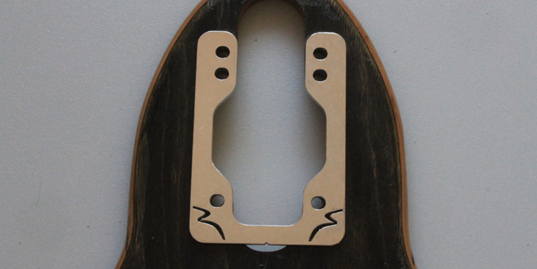 Though not very common, directional concave can be found on some freeride and downhill decks. In slalom and downhill, it is more common to use directional boards. Minis are usually directional too. There are also some adapted boards that only make sense to be ridden one way. Some board features, like built in wedging or middle drops, are meant so that the board is set up in a specific way and ridden in one direction only. The features enhance the ride, but also make it uncomfortable to ride the deck switch. The Omen Phoenix has a middle drop. The way it’s supposed to be ridden forces your front foot to sit higher than your back foot. This gives you less leverage over the back truck and more over the front truck, increasing stability. Truck positioning is something that easily catches the eyes of beginners. Some have never seen trucks mounted through or flushed into the board, and all these things look exciting. There’s a reason for each type, and they all affect to way your board will ride. If you are in the market for a great set of trucks, check out our post on the 13 best longboarding trucks. The most common way any deck is mounted is by top mounting. The trucks are simply on top, the way you typically see them. A true top mount board is more agile and responsive than the other types, assuming you’re using the same trucks on the same wheelbase. This is because you get more leverage over the trucks, turning is easier and snappier. With drop-through decks, the trucks are mounted through the board. This is a concept almost exclusive to longboards; it’s more common to see in LDP (long distance push) and certain cruisers. Some downhill and freeride decks have this option, but it is rarer to see. Since the platform is significantly lowered, there is less leverage over the trucks but a lot more stability. Some people dislike drop-through boards, as the turning can feel sluggish. Since the platform is supported by the screws instead of the truck baseplates, it is recommended to use something to distribute the weight, such as wider washers or support backing frames. A deck adapted for drop-through boards can almost always be mounted with the trucks on top too. Boards can be differentiated by their platform positioning. The platform is the part of the board that you stand on. A top mounted deck that isn’t lowered anywhere means the board is a true top mount. The standing platform isn’t lowered and there’s as much leverage on the trucks as can be. A true top mount has the potential to be more agile than any other type of longboard deck. Drop-through decks can also have a platform with no lowering. It would be a lot less responsive than a true top mount but the stability is increased. The simplicity of this type of deck makes for an easy choice for beginners since they tend to be cheaper. A lowered platform is also called a dropped platform. A deck with a drop has its standing platform lower than the area where the trucks are mounted. This can include microdrops and flush mounts. As Zak Maytum, a downhill longboard racer from Colorado, once said, “You never go full top mount” (at least if you plan on going fast). Like everything in skating, this is just preference, but a lowered platform gives you that extra stability that is nice to have sometimes. The Omen Chief has a very deep drop as well as built in wedging. The directional truck setup forced by the wedging makes it one of the most stable and comfortable rides out there straight out of the box. Zak Maytum’s pro model features deep flush mounts and a rocker platform. While it is still a top mount, the platform is slightly lowered. This, coupled with the longer wheel base makes for a more stable ride. Drop through boards with a lowered platform are called double drop-throughs. Double drop-throughs are lower than most other decks. There are some top mounted drop decks with an extreme drop. It’s not uncommon to see them in LDP, where the lower the board is the more comfortable the pushing is going to be. Some people like them for freestyle and it’ll come with kicktails for that. Double dropped decks are eye catchy for beginners that have never seen them, but keep in mind that they have the same problems regular drop-throughs have. Looking at all the different types of longboards can be confusing. But if you focus on what type of riding you plan on doing, just use our guide and you’ll make a much more informed decision. To get a nice long life out of your deck make sure to clean and maintain it properly. Along with the board itself, it’s helpful to pick out a great pair of longboarding shoes. If you’re looking to take longboarding seriously, going with a durable shoe made for skating will be quite helpful.